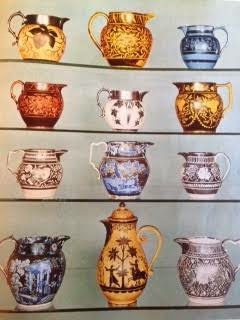 English lustre ware is well-loved. High prices and and a wealth of shoddy reproductions have not dimmed its enthusiasts. Early items are now over 200 years old. Lustre its metallic surface - silver a hundred shades of gold and copper from delicate pink to richest purple. The finest specimens are lavish and beautifully decorated. A piece bearing its makers name is quite rare. 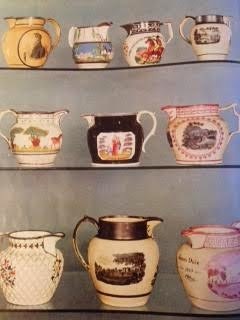 The development of lustre ware in England, came from the desire to create Moresque effects on the newly evolved creamware, which was bringing great wealth to the Staffordshire master potters. with its transfer decorations in blue. Little success was achieved until the early years of the 19thc. Silver stencilled and resist lustre jugs. John Hancock an enameller employed by Josiah Spode at Stoke, claimed to have produced lustre wear in 1789. 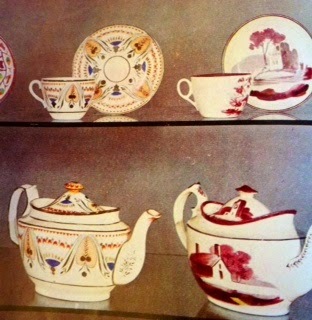 In a letter to the Staffordshire Mercury in 1846 Hancock declared that he had discovered and put into practise the gold, silver and steel lustre at Spode. The statement remained unchallenged. 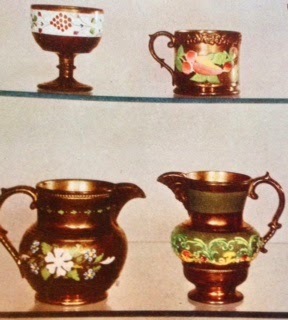 Gold lustre was not successfully produced until early in the 19thc. The scarcity and high price of gold encouraged the potters to turn their attention to the production of silver lustre from platinum oxide and the less expensive pink lustre from gold chloride. purple even at its palest.